Still an independent family business ~ Est.1902 serving Hayes, Middlesex & Hanwell, London W7 and the surrounding area with care and dignity. 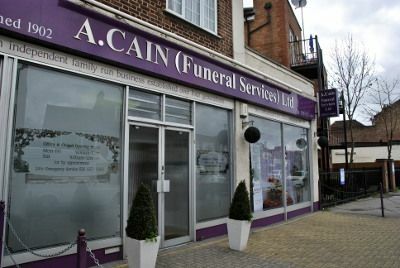 A. Cain (Funeral Services) Ltd respect the wishes and religious differences of the individual and will tailor the arrangements to the requirements of each family, and can accommodate most requests, including repatriation service and the purchase of pre-paid funeral plans. A. Cain (Funeral Services) Ltd is a member of SAIF (The National Society of Allied & Independent Funeral Directors).